The next step in accelerating the movement toward a fully integrated and innovative digital ecosystem based on open standards. Learning Tools Interoperability® (LTI®) revolutionized the way educators and students access digital learning resources, apps, and tools within any learning management system (LMS) by enabling a one-click, seamless connection. LTI is currently implemented in over 70 learning platforms and hundreds of learning apps and tools. It is the only educational technology industry standard that securely connects your institution’s LMS with external learning tools, confirms the tool’s credentials, and exchanges information in teaching and learning workflow. Now, IMS Global Learning Consortium is enabling dramatically better usability and data security through LTI Advantage—a package of extensions that build on LTI 1.3 to add new features that facilitate deeper integration of any tool with any LMS and offers more advanced protection of the exchange of sensitive student data. Currently, the three LTI Advantage extensions are Names and Role Provisioning Services, Deep Linking, and Assignment and Grade Services. What Does it Mean to be LTI Advantage Certified? To become LTI Advantage Certified and be listed in the IMS Product Directory a product must pass a series of situational and operational test conditions, including actual security operations. When a product completes certification testing for LTI 1.3 Core and all three LTI Advantage extensions it will be recognized as LTI Advantage Complete. LTI Advantage Complete certification is required for Learning Platforms and available for Tools. Any Tool that completes certification for LTI 1.3 Core and either one or two extensions is considered LTI Advantage Certified. 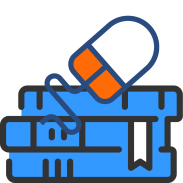 Products with only the LTI Advantage designation may be working toward LTI Advantage Complete certification or do not support all of the extensions. Sends a list of course participants and faculty defined groups to learning tools in a safe and secure manner. Enables a more intuitive way to add content and links to a platform from a learning tool or publisher content. Exchanges assignment progress, instructor comments, and scores from an assessment tool to the gradebook platform. 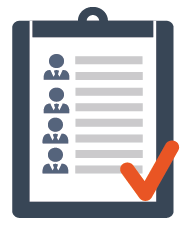 With LTI Advantage you can streamline the provisioning of course enrollment and automate the passing of assignment scores and grades from your digital tools back to the LMS. LTI Advantage builds on the LTI secure connection by adding a profile that provides a trusted foundation for better app administration, privacy, and security. 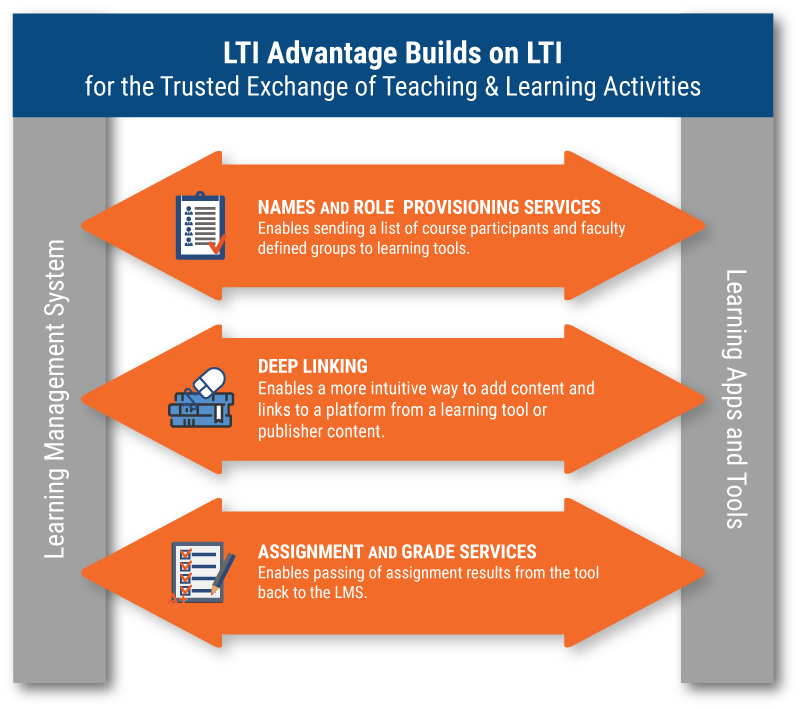 LTI Advantage improves your digital learning ecosystem by making it more intuitive for faculty to integrate third-party resources, apps, and tools in the right place in the LMS and to continuously sync results. LTI Advantage uses the latest security model adopted by IMS based on industry best practices for user privacy and security. This new model provides improved consistency between IMS specifications and better support for mobile implementations. LTI Advantage is the gateway to enabling digital transformation—rapidly advancing an educational technology ecosystem where users have more options for innovative tools that work together and result in better learning. The IMS ecosystem—interoperable products that enable a more cohesive and effective teaching and learning environment—is advancing to LTI Advantage now. All of LTI Advantage is provided from a set of open standard extensions vetted, supported, and certified by IMS. IMS higher education institutional members are encouraging all edtech suppliers to adopt LTI Advantage. You can help by insisting on LTI Advantage certification by IMS in your procurements and verifying which products have achieved IMS conformance certification via the official IMS Global Learning Consortium Certified Product Directory—updated daily at imscert.org. Learning environments, tools, and digital content that implement the LTI Advantage features will enable institutions to move beyond first-generation learning architecture by enabling deeper integration that ensures better teaching and learning experiences. Automates course enrollment into a third-party tool in a safe and secure manner, and allows faculty to receive reporting on student activity within the tool. Simpliﬁes the arduous task of selecting and adding links to content when developing a course, including deep integration to collections of content such as playlists and a table of contents. 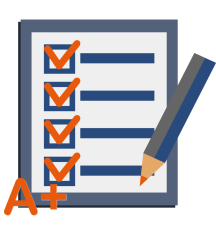 Enables faculty to sync grades and comments in third-party tools into a single place, such as the LMS grade book, which gives students and faculty a clearer picture of learning progress in one place. LTI Advantage is a step in the right direction in providing an ecosystem of connected technologies for the enhancement of teaching and learning. Through standardization, Purdue can find, test, and implement tools quickly with minimal overhead. LTI Advantage will enable instructors to spend less time moving people, grades, and data back and forth and more time engaging with students or doing research. LTI Advantage allows Penn State to fully integrate technology-based learning tools within our Learning Management System. LTI Advantage provides faculty and students with seamless access to digital content and technology tools. Additionally, it provides an additional layer of data security, protecting student data across our learning tools ecosystem. IMS Global Learning Consortium standards are yet another opportunity to utilize agile technology to enhance learning in timely, secure and cost-effective ways. The learning technology ecosystem is self-organizing, dynamic and evolving. In this context, supporting pedagogical and technological innovation requires the ability to rapidly and seamlessly integrate new tools in a privacy conscious way, and that is facilitated by a commitment by institutions and learning technology suppliers to adopt LTI Advantage and keep up-to-date with all applicable standards.